You've booked your holiday but have you bought travel insurance? I don’t want to sound holier than thou but in our opinion, if you can’t afford travel insurance you can’t afford to travel. One mishap can totally bankrupt you or your family and who doesn’t want to be back in their home country ASAP if anything goes seriously wrong. 1. Medical assistance is very basic or practically non-existent in many places we visit. You might ask why the hell we would want to go to these places, but that’s another story. The fact is we do and we are very aware that if we get hurt or come down very ill we need to get out to somewhere we can be treated properly as soon as possible. 2. If there is “International standard” medical assistance, it can be extortionate. We can budget in the insurance policy no problems but we’d be stuffed if we had an extra $10 – $50,000 or more to fork out because we didn’t have insurance. 3. Despite the fact we travel very cheaply, we are considered extremely wealthy in developing countries. Whilst we have never had anything stolen and are extremely careful with our security, our cameras, computers and other bits and pieces are worth more than many people’s monthly or even annual salary. 99% of people in most countries are honest and wouldn’t dream of stealing despite the fact are so poor. However, there is always the minority and obviously a temptation there. One slip and they’re gone and they would be very expensive to replace. 4. We like to push the boundaries when we travel. Yes, that road/bus/boat looks a bit dangerous but the experience we will have will be worth the risk a thousand times over. We’ve been in a micro-light over Victoria Falls, skydived in New Zealand and both have our diving licenses. We quite often hire a small motorcycle and go travelling around country roads at our own pace. And now we’re into long-distance, self-supported bicycle touring. All of these activities have inherent risk and we’re prepared to take them to have new experiences, but it’s nice to know if things do goes wrong we have support. 5. It may not be you that gets sick or dies. What happens if one of your close family falls gravely ill or passes away? Wouldn’t you want to get home as quickly as possible? Of course, there are exclusions around pre-existing conditions but at least with those, you can make an informed decision before you leave town. It’s the unexpected circumstances that you’re insuring against. We have been overseas on and off for almost 10 years. During our first 3.5 year adventure, and then for the first four after we left in 2010 we insured with Covermore. They were great for the few times we needed them. However, we’ve since switched over to World Nomads. Note that Covermore (AU) only covers Aussies and requires you to start your journey from Australia. When Tim got a kidney stone in Vietnam in 2014, Covermore were awesome. They had great support while he was being treated and gave us a full refund of all our costs without any argument. $700 (US) goes a long way in Vietnam. But more importantly than the money, I felt they were actually concerned about Tim’s welfare and how I was coping. World Nomads has given us the same great service. I had a scary episode while on Grand Cayman that could have ended our 4-month Caribbean sailing trip in the first month. Thankfully it turned out to be something harmless, but I was grateful for their excellent support, calling and emailing me regularly to see how I was going. The claims process was super simple, even though I couldn’t get the exact documentation they asked for. That claim was $600 USD! When Tim was admitted to hospital in Kuala Lumpur for over a week early 2019, World Nomads really shone for me with their customer support. If the condition he had didn’t respond to antibiotics, it would have required surgery and maybe an evacuation back to Australia. Thankfully it didn’t come to that but I really felt they had our backs if the need did arise. We had to jump through a few hoops to provide all the documentation they required to prove that it wasn’t a pre-existing condition but they then took over the payment responsibilities for the full $5000. Not having to pay upfront and then wait for the claim to get it back was a relief. (See Our hints for Documentation below.) Had we still been in the USA, that bill would have had at least 1, maybe two zero’s on the end. That’s a life-changing disaster and could have ended our travels permanently. I was on the phone and in email contact with them at least once a day and they did everything they could to support us through the ordeal. It was a relief not to have to pay out such a large amount and then wait to claim it back. Both Covermore and World Nomads cover the activities we like to participate in and have different levels of policy to cover our various trips. However, I think World Nomads’ website makes it easier to ensure you have all your bases covered. Both prepared to extend a long-term policy for over twelve months at a time, although Covermore limits this to 18 months now. Both websites are easy to use for quotes, purchase and claims. Safety Wing is a new kid on the block in travel insurance for long-term travellers. Their policies are especially attractive for younger digital nomads who don’t want to pay for a 12-month policy up front. Automatic reoccurring four-weekly payments up until 12 months when you then need to renew your policy. This means you have no huge upfront bill. If you go home early, you don’t forfeit huge amounts of cash as you can stop at any time. You can also flick between the US included and not included as needed by signing up for a new policy. If you’re only going for a month in the middle of your trip, this can save you hundreds over a 12-month policy that includes North America. They have a much longer period that you can return home for incidental purposes. For every 90 days you are insured you can be home for 30 (15 for Americans). By comparison, World Nomads is ? and Covermore is ? They appear to have limited coverage for acute onset of pre-existing conditions. I would want some serious conversations to understand exactly what this means as I’m sure they have a lot of wiggle room with this but it seems much more generous than other policies that don’t entertain some preexisting conditions at all. Choose a travel insurance company with a good reputation and who has been around for a long time. You don’t want your insurance company to go under while you’re on the road or you might be stuck with no cover. Read reviews from customers (and not just those the insurer promotes on their website!). You have to read between the lines though. The rules are pretty clear on making claims and some people will definitely try and push the boundaries and then whine if they’re not successful. I find Trustpilot a good source of independent reviews. Make sure you have a policy that includes your destination. We travelled for around 12 months in Asia with 5 weeks in Japan which normally attracts a higher premium. We clarified with Covermore in writing if we were covered by the Asian Policy even though we were visiting Japan because the majority of our time was in other countries in the lower band. Some travel insurance companies won’t cover some nationalities in some countries AT ALL!! For example, Safety Wing won’t cover anyone to visit Cuba, Iran, and North Korea. World Nomads and many other companies also have similar exclusions for North Americans, although Aussies are quite OK to visit Cuba. Covermore will insure Australians for all of those destinations. You need to check! Make sure they offer 24-hour assistance with a free call number from overseas. I do not want to wait for “office hours” to kick in before I get some action. By the time I got home from the hospital in Ho Chi Minh City, it was midnight in Australia. I still got an exceptionally professional, caring and helpful response from the international contact line. Make sure you understand what possessions are covered by your policy. Itemize any special items of extra value and pay the extra premium if necessary. The last thing you want is to have a disappointing exclusion or be out of pocket if the worst happens. Copy it and give it to at least one or two trusted people in your home country who can provide the information if you lose yours or are unable to provide it because you are incapacitated. Keep their contact details somewhere they can be found if you are unable to provide them. I email ours to both my, and Tim’s sisters, who can provide details if required. Make sure any travelling companions or the company you are travelling with have a copy of your policy and the emergency numbers. If you are out of action, at least they can initiate contact with the company. For Australians – Activate a MyGov account and link your Medicare records before you go. That allows you to access your records online and satisfy any questions about pre-existing conditions. If you visit a medical practitioner or facility while you are travelling then scan and keep those details somewhere safe, but where you can access them if required. Ensure you have a list of stuff you are taking on your holiday, including any receipts if possible. That will make any claims so much easier. Ensure you contact the police if anything gets stolen. Don’t believe for one minute they will be of much help in recovering anything but you MUST get a police report detailing the event to make a successful claim. 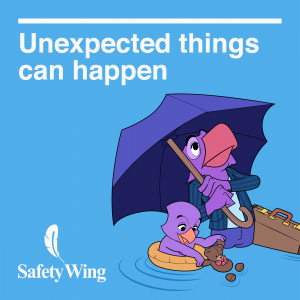 Remember – insurance is for the unexpected. Sure, make a claim for everything you are entitled to but don’t abuse the system, it just makes premiums more expensive for the rest of us. Disclosure: World Nomads, Covermore and Safety Wing are our affiliate partners and do pay us a small commission if you take out a policy via our website. However, we have used them, have been happy with them, would recommend them to friends and family and will use them again without hesitation. We would love to have your opinion on this subject, especially if you have had an experience with World Nomads, Covermore or Safety Wing…GOOOD or BAD. So please leave a comment below. Previous story Damn Google Maps….Cycling from Torquay to Warragul via the Mornington Peninsula.